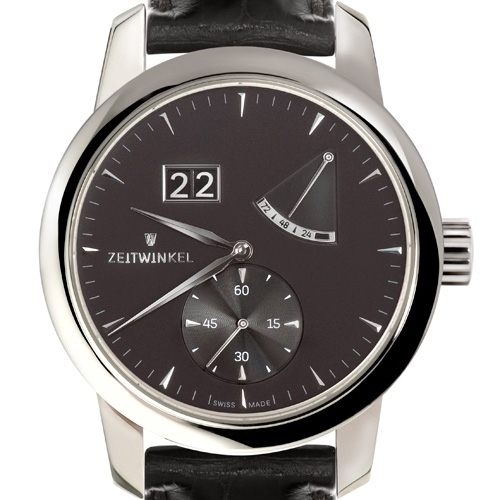 Zeitwinkel expresses its nature through the 273° model and notably through its aesthetic choices, thanks to a clever play on contrasts between rounded and linear shapes, polished surfaces and textured zones that make this timepiece so distinctive. It also reveals its character through its approach to customer relations, since the youthful Saint-Imier-based brand is earning a constantly enhanced reputation for its mechanical ingenuity and its independence, while continuing to focus on direct contacts. The patented large date display at 11 o’clock, the power-reserve indication and the exclusive in-house ZW0103 calibre eloquently express the brand’s expertise. An investment timepiece.